This weekend John and I dropped Scout off at bird dog camp in Prescott, Arizona (about 1.5 hours from Phoenix). She will be there for two weeks, come home for two weeks, and then go back for another two weeks. We were so sad to drop her off, and we don't really know what to do with ourselves without a tornado puppy making us crazy all day at home! 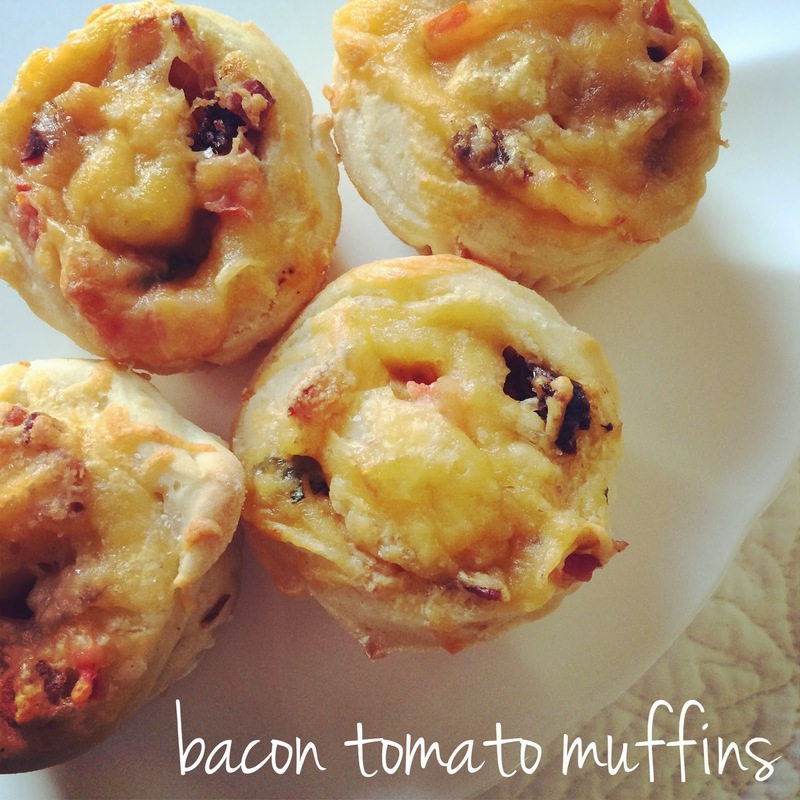 Since I had some time on my hands, I decided to make bacon tomato breakfast muffins for John to eat this week - and these bad boys are tasty!! 1. Combine all of the ingredients for the dough and knead until pliable; cover the dough and let rest for 45 minutes. 2. Roll out the dough into a long rectangle; spread the desired amounts of the filling over the dough leaving one inch from the edge clean. 3. 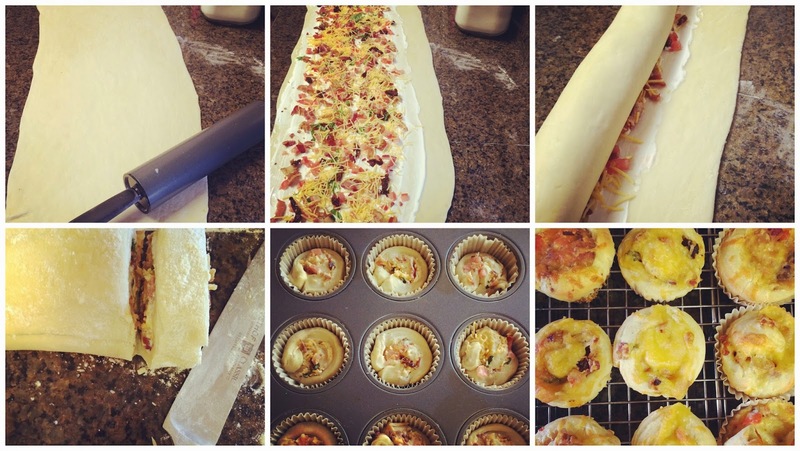 Roll the dough and filling length-wise and wet the edge of the dough to seal close. 4. 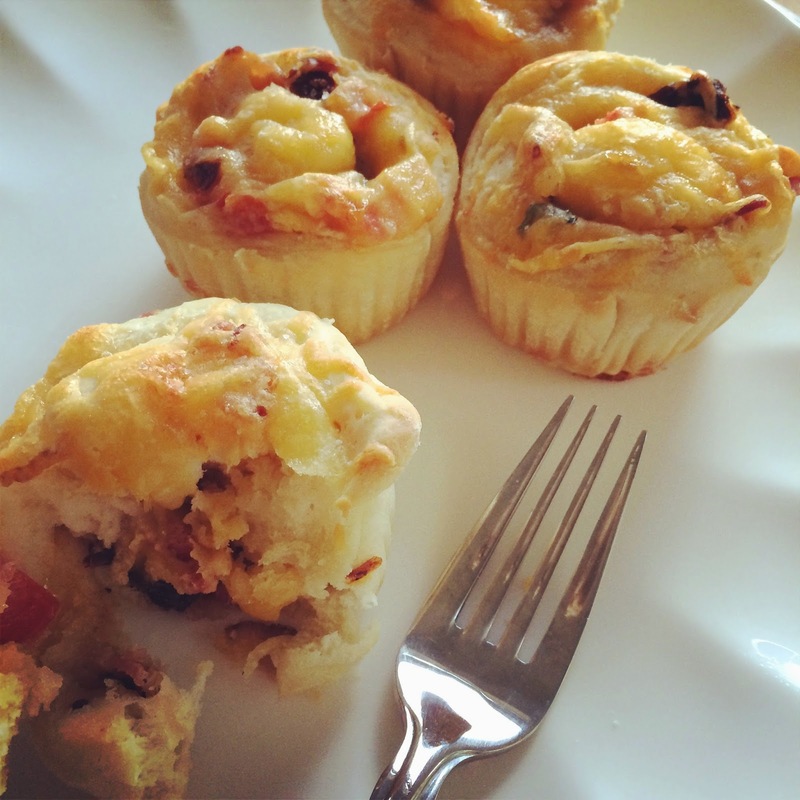 Slice the dough into one-inch pieces and place in a muffin tin; top with a small amount of shredded cheese. Bake for 15-20 minutes at 400 degrees. 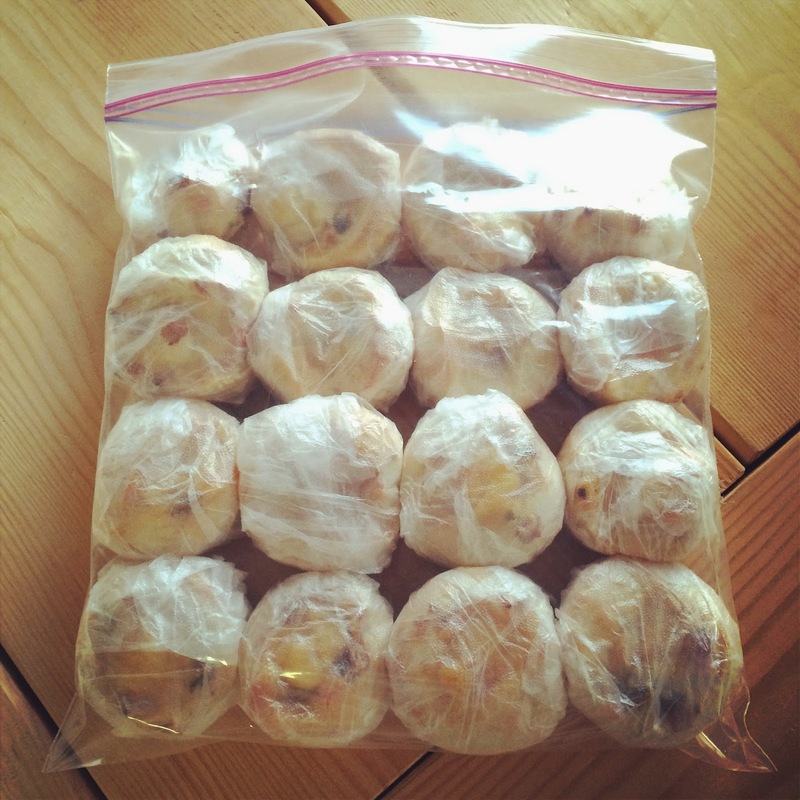 These muffins are amazing fresh, but can be frozen for up to 3 months. This recipe makes 3 dozen, so I froze two dozen for John to microwave in the morning for 30 seconds for a perfectly yummy breakfast! I'm not a huge breakfast person, but if John doesn't eat as soon as he wakes up, the man gets hangry... and no one wants that! Zapping these in the microwave for 30 seconds is a great and easy alternative to bagels, etc. 3 dozen muffins!!!!?? I would be so sad without our pup around too. Two weeks is a long time! I hope it flies by quickly & y'all are reunited with your pup child before you know it! And she comes home with some fresh skills! Hugs! Those look great! My husband's garden is finally yielding more tomatoes than we know what to do with. And my husband loves bacon. The muffins would probably freeze well, too! Thanks for sharing! My husband would love these! And it's pretty much perfect for breakfast on the run! Those look delicious! The recipe makes so many, those would probably be great for a party! These look like a great breakfast on the go. Hopefully you'll keep busy and these 2 weeks without your pup will fly by for you! Making these this weekend for sure! You had me at BACON! My pregnant self now wants this for lunch. These sound so good! My husband is the exact same way... he needs to eat and have a cup of coffee within like 5 minutes of waking up! Wow, I don't even eat tomatoes and these look delish! Umm yum!! Those look and sounds amazing! I just pinned these, doll. Thanks for sharing. PS: You're so beautiful. Hate you! Your recipes always look so delish - I love that this makes such a big batch for easy, quick breakfasts! Dang it Lisa I drooled all over my iPad bahaha. I swear I would eat ALL of those in one sitting. Zero regrets lol. Pinned this so I can make them this weekend. I found your recipe over at the Tuesday’s Table link party. I host Tickle My Tastebuds Tuesday and would love it if you would come over and share this recipe. I’m sure our party goers would love it! Here is the link http://bit.ly/1kRX8Tm. Have a wonderful day! Say the word bacon and my hubby comes running! I need to try these. You amaze me Lisa! !